Here is a quick guide on becoming 0 to hero on Varsity Esports. This guild will take you from signing up all the way to competing on Varsity Esports. Free Agents are NOT allowed to join Official School Clubs that they are not attending as a student. Violating this could result in a school ban. After the application has been filed, your club will be approved by an HSEL representative. This process can take 1-2 days to complete. The HSEL representative needs to verify the identity of the applicant. Once the identity of the applicant has been verified, the club will receive a status of approved on Varsity Esports. Once the club is approved, you can add students to the club as "members." Members can be added by clicking the actions drop down and navigating to Members. On the Members page, the club administrator can type in email address of students they wish to add. This will send an email to the student, promoting them to join the club by clicking a link provided in the email. The student then will be asked to log in or sign up on Varsity Esports. Once they do either of those, they will be placed in the club. Every student wanting to compete must establish a game connection, or else they will not eligible to be placed on a roster. A game connection must be established for every game the student is wanting to play within the HSEL. A game connection can be established by a student if they click their profile icon, navigate to "Settings & Preferences" and selects game connection. There, they can add any game they wish with an in game identifier. UPDATE: We no longer offer monthly subscriptions. All subscription options are now season long options. Student can pay for their own subscriptions on their dashboard. Under the payment widget, the student can enter the individual pay center. There they can enter their billing information, select a subscription type, and press "Create Subscription." From this screen, they can cancel their subscriptions any time. When buying a pass mid season, the price will be prorated based on time remaining in the season. School clubs can pay for their students electronically on the Varsity Esports system. They can do so by first activating club pay in their club settings. Navigate to the actions drop down by your club name, and select "Club Settings." On the settings page, press "Enable," then press "Save." Once enabled, to purchase slots, enter and add your payment method, and type in the number of slots you wish to purchase. The more slots you purchase, the cheaper the unit price is. Please consult our pricing guidelines here. The Slots will be active for the duration of the season. When buying slots mid season, the price will be prorated based on how far into the season it is. Once the slots are purchased, you can navigate to "Manage Slots" under the actions drop down. To add students to your slots, press "Add to Slot" next to their names. To remove students from slots, press "Remove From Slot." When you are done editing, press "Save Changes." The students occupying slots will now be active. For schools who need an invoice for payment processing, we are happy to issue invoices. Please inquire by emailing payments@highschoolesportsleague.com. Club Administrators can create rosters by navigating to their club actions drop down and selecting "Rosters." Once on Rosters, pressing "New Roster" will take you to the new roster screen. Provide a name for the roster, the game the roster will be participating in, and the type of roster: Static or Dynamic. Static rosters are for team based games. Dynamic rosters are for single player/solo games. 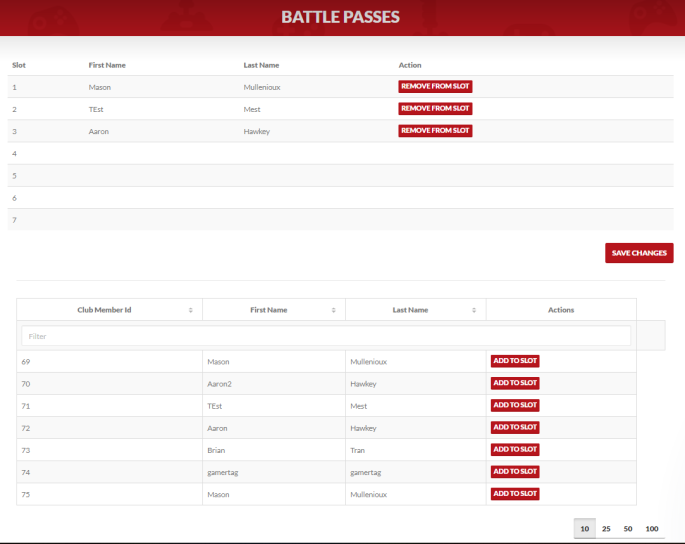 Dynamic rosters allow you to place all solo players on one roster and batch enroll them for tournaments as individuals. Once the details are selected, you can add members to the roster by pressing "Add." Game connections must be established for that game or else the member will be rejected from being added. Note: Paid, active members only show as eligible to be added to a roster. If they are not paid, they will not show up on the roster screen. Click on the drop down menu and select the roster you wish to enroll. When you have done that, click the red 'Register Roster' button, and you are all done!